The Arabian plate is located in the Middle East of Asia and is home to the countries of Kuwait, Bahrain, Qatar, the United Arab Emirates, Oman, Yemen, Saudi Arabia, Syria, Jordan and Iraq (Konert et al., 2001). The Arabian plate separated from Africa approximately 25 million years ago, resulting in the closure of the subducting Tethys sea in the northeast (Johnson and Stern, 2010). The rifting of Africa and Arabia opened the Red Sea as well as the Gulf of Aden, bordering the plate on the southwest and southern sides respectively (see figure 1). The Red Sea has a spreading half rate of roughly 10mm/yr and the Gulf of Aden is believed to be a propagating rift opening westward at a rate of approximately 3 mm/yr (Vita-Finzi, 2001). 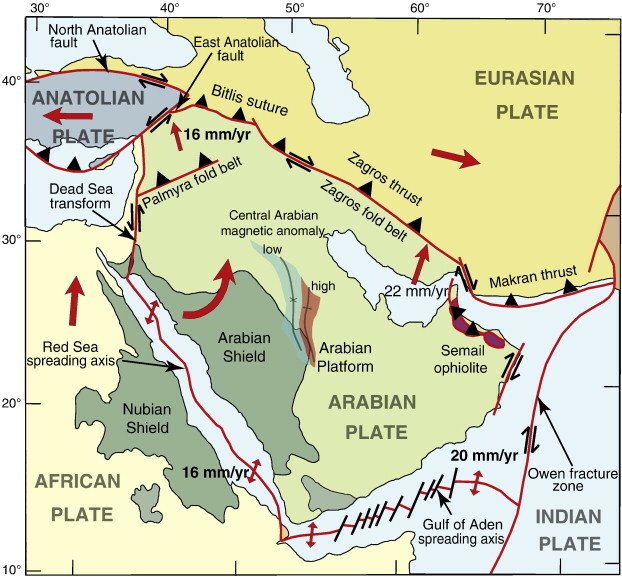 As the Red Sea continued to open, the Arabian plate eventually collided with Eurasia and this collision zone is delineated by the Zagros Mountains. This mountain chain has a shortening rate of 9 ± 3 mm/yr in the SE and 5 ± 3 mm/yr in the NW (Hessami et al. 2006). The Dead Sea transform fault borders the Arabian plate in the west and has experienced approximately 107 km of left-lateral displacement since the mid-Miocene, which translates into roughly 6-10 mm/yr of slip on the fault (Vita-Finzi, 2001). Finally, the plate is bounded in the east by the Owen Fracture Zone (Johnson and Stern, 2010). The Arabian plate runs roughly 2600km N-S and 3000km E-W, with an approximate plate thickness of 40km (Johnson and Stern, 2010). The upper crust has a crystalline Precambrian basement that is Neoproterozoic in age (1000-540Ma) and is referred to as the Arabian Shield. Its lithologies include schists, amphibolites, gneiss, meta-basalts, greywackes, cherts and andesites (Wagner, 2011). Overlying the shield are Phanerozoic sediments (excluding the SW region) as well as Cenozoic flood basalts in the west (Johnson and Stern, 2010). This sedimentary/volcanic package is referred to as the Arabian Platform and it thickens towards the east. The sedimentary rocks are primarily carbonate and siliclastic deposits, with intermittent evaporates. The exposure of the Arabian Shield in the southwest (see figure 1) as well as the thickening of the Arabian Platform towards the east is generally attributed to uplift from rifting in the Red Sea and from loading in the north due to collision with Eurasia. According to BP's Statistical Review of World Energy 2013, the Arabian plate currently holds 48% of the World’s oil reserves and 43% of the World’s natural gas reserves (BP, 2013). The fertility of the plate with respect to oil and gas can be attributed to its tectonic history. The conditions were such that the Arabian plate experienced approximately 570Ma of nearly uninterrupted sedimentation, an ideal setting for hydrocarbon generation. Read more on the RESOURCES page. As previously mentioned, the Zagros Mountains mark the collision zone between Arabia and Eurasia, and this active convergence leads to much seismicity in the area. There are many and frequent earthquakes reaching surface wave magnitudes of 7.0 and at focal depths within the upper 20km of crust (Jackson and Talebian, 2004). The shortening rates are faster in the SE than in the NW and this is due to the counterclockwise rotation of the Arabian plate (Hessami et al. 2006). As a result, the SE experiences shortening perpendicular to the trend of the fold-and-thrust belt, and the NW collides oblique to the trend (see figure 4; Jackson and Talebian, 2004). The Arabian plate hosts extensive Cenozoic basaltic plateaus that run parallel to the Red Sea, referred to as the Harrats (Al Kwatli MA et al., 2012). In total they cover an area of 180,000 km^2 and are considered to be associated with rifting in the Red Sea during the Oligocene. 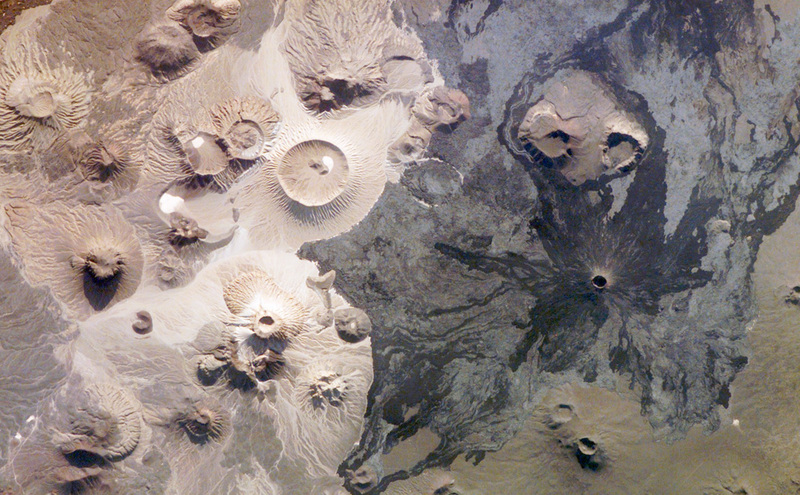 The largest of the volcanic provinces is Harrat Ash Shaam - it spans 50,000 km^2 as pyroclastic cones, shield volcanoes and hydromagmatic craters. Two periods of volcanism have been determined for this volcanic field; the first spanning from the late Oligocene to the mid-Miocene and attributed to the Red Sea rifting, and the second from roughly 13 Ma to present in response to the counterclockwise rotation of the Arabian plate (Al Kwatli MA et al., 2012). Al Kwatli MA, Gillot PY, Zeyen H, Hildenbrand A, Al Gharib I. 2012. Volcano-tectonic evolution of the northern part of the arabian plate in the light of new K/Ar ages and remote sensing; harrat ash shaam volcanic province (syria). Tectonophysics 580:192-207. Beydoun ZR. 1998. Arabian plate oil and gas; why so rich and so prolific? Episodes 21(2):74-81. Hessami K, Nilforoushan F, Talbot CJ. 2006. Active deformation within the zagros mountains deduced from GPS measurements. Journal of the Geological Society 163:143-8. Stern RJ and Johnson P. 2010. Continental lithosphere of the arabian plate; a geologic, petrologic, and geophysical synthesis. Earth-Sci Rev 101(1-2):29-67. Talebian M and Jackson J. 2004. A reappraisal of earthquake focal mechanisms and active shortening in the zagros mountains of iran. Geophysical Journal International 156(3):506-26. Vita-Finzi C. 2001. Neotectonics at the arabian plate margins. J Struct Geol 23(2-3):521-30. Wagner W. 2010. Groundwater in the Arab Middle East. [place unknown]:Springer. p.1-61.